The Arnhemsche Fayencefabriek known as the factory of the brothers Jacob and Klaas Vet. The brothers grew up in Purmerend, where the late 19th century displacement teel Brantjes bakery was active. Both wanted to be pottery baker. Klaas would learn his trade at “Plateelbakkerij Zuid-Holland” and later at “De Distel”. Jacob would learn the trade from Brantjes. In September 1903, the brothers founded the pottery factory Purmerend, the plant would bear the name of Jacob, firm Jb. Vet & Co. Within this factory Jacob was the business manager, Klaas was responsible for the models and was artistic director. In 1906 the company burned down. However, the warehouse remained models spared. On March 13, 1907, the brothers founded the “Arnhemsche Fayencefabriek”. The factory produced in the first period pottery similar to the models and sets from Purmerend. Later more colorful sets were added. The plant experienced in the early twenties heyday and had to expand the factory several times. 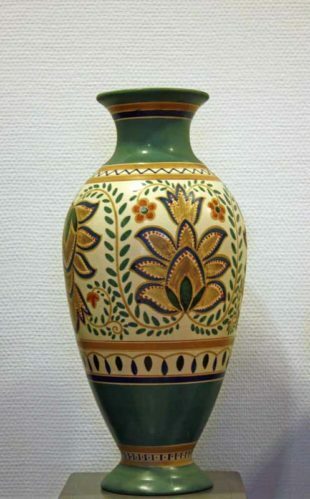 During the crisis period in the thirties hand-painted pottery was too expensive to produce and they went to the production of pottery with glaze flow in various colors. In 1934, the crisis led to the cessation of production and eventual closure of the factory. The factory has many decorative pottery made as vases, jardinières wall plates and flower pots. In addition, there was the production of luxury crockery used as dinnerware, smoke and liqueur sets, inkwells, candlesticks and souvenir pottery in the form of nuggets, plates etc. with city arms. Many of Klaas models are inspired by the simple and graceful models from “De Distel”. Also, conventional models, as applied by “Rozenburg”, used for inspiration. Some of the models were created from existing models by removing or adding ears. In the initial period, 1907 to 1910, there was a choice of two types of decors. The dark gloss with sets by flowers and butterflies and linear decor on a white background executed in a matt glaze. Another type of pottery dating from this period, a red color as a substrate with this straight sets. In the period from 1910 to 1917, in addition to the aforementioned sets in a variety of decors: Persian was conducted on a light brown ground, the decor Lindus had two versions one with white flowers and with blue flowers. The decor S.O. is a linear decoration in white, green, ocher and black. The decor M. B. suggested the agreement with Mat Flowers of South Holland and consisted of a less abstract version of linear sets of flowers and insects. There was also a neo-empire style decors which were conducted partly in gold on a white or blue background. In 1917 much happened with the sets by the departure of several painters and the advent of WP Hartgring. Hartgring would be responsible for the large amount of new decors such as Flora, Pensee, Polo (a glossy versions of Corona of South Holland), Gelri, Poppy, butterfly, decor Bird, Sun, Toni, Tini. From 1928, the heavy period dawned for the pottery and the sets consisted only of power and spray glazes: the so-called crisis pottery.